Q: I'd like to use these with an extra-curricular group starting September and would probably need to order about 15 kits - would you anticipate being able to fulfil such an order? 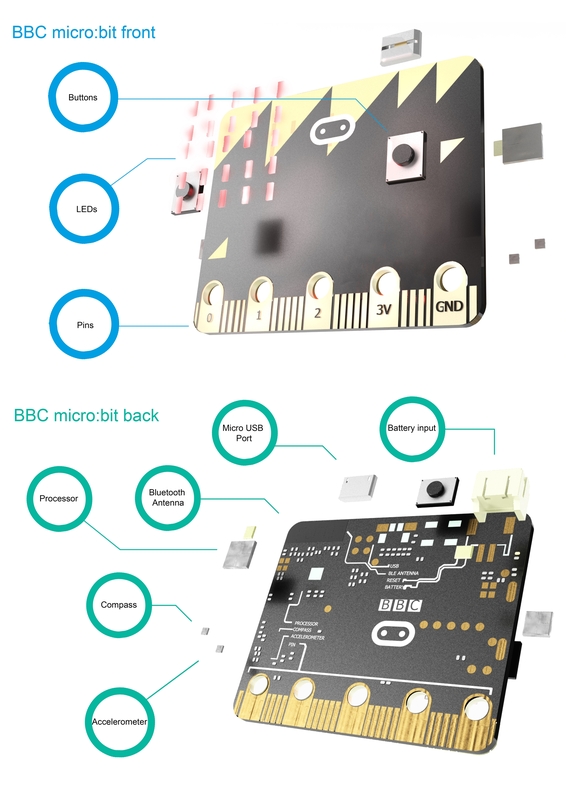 We are currently experiencing high demand for BBC micro:bit inventors kits mainly due to the imminent launch of the micro:bit outside of schools. We are however in the process of building lots of these so that we will then be able to have stock of them, we are also waiting on the BBC micro:bit to go with the kit. However both are likely to be in stock in a couple of weeks. At the moment we are trying our best to keep up with demand, but are finding that the micro:bit range keep going in and out of stock. There won’t be an issue with having stock for September but as we process out of stock orders in the sequence that they are placed it is worth placing the order early so you are at higher up the que. Q: What language(s) do the experiments use? Hi Ashley, Currently experiments 1-4 are based in block editor, 5-10 are in touch develop editor. A: Hi Arnar, Firstly we can ship to Denmark via the website. Secondly although you technically don’t have to solder to use the kit you would need to push the components into the breadboard for the experiment you are working on. As such you could use this product without any soldering skills. Q: Hi, I'm thinking of using the Micro:bite to teach the electronics part of GCSE & A level engineer. Do you think it would be suitable? A: Hello David, Thank you for your patients while we looked into this for you. In short the micro:bit is a good choice for delivering sections of the engineering qualification. The AQA Engineering qualification specifically ask for the following: 1. Electrical systems comprising: •	power supplies (mains and batteries) •	input control devices (for example relays and switches) •	output devices (motors, buzzers, bells, lamps and solenoids). 2. Electronic systems comprising: •	inputs (for example light or temperature sensors) •	analogue and digital signals •	process devices: o	timers o	counters o	comparators •	logic (AND, OR and NOT). And more importantly: Interfacing components: drivers required for loads that process or programmable devices cannot supply (transistor, field-effect transistor (FET)) So as long as the micro:bit is going to have the various input and outputs the specification calls for connected to it along with drive circuitry for higher current output it will cover the requirements. The micro:bit allows for 3 devices inputs or outputs to be connected using clip leads to clip through the circular holes at the bottom of the micro:bit which for most project will be all you need. If you wanted to access more pins or for an easy way to connect and prototype circuits we do a break out board that gives full access to the pins and is mounted on a plate with a breadboard, see www.kitronik.co.uk/5609 Kitronik would like to thank Paul Boyd educational consultant for help with this answer. Q: Hi, does this set come with the microbit included? Experiment 2 Using a Light Sensor and Analog Inputs from the Kitronik Inventors Kit for the BBC microbit. We've included the entire experiment as a free example of the great practical experiments that are contained within the Inventors Kit. Learn how to build the circuit and how to code the microbit to control the circuit.